The University of Georgia at Athens (UGA) is the flagship institute of higher learning in Georgia, but tough economic times have made necessary expansion difficult. 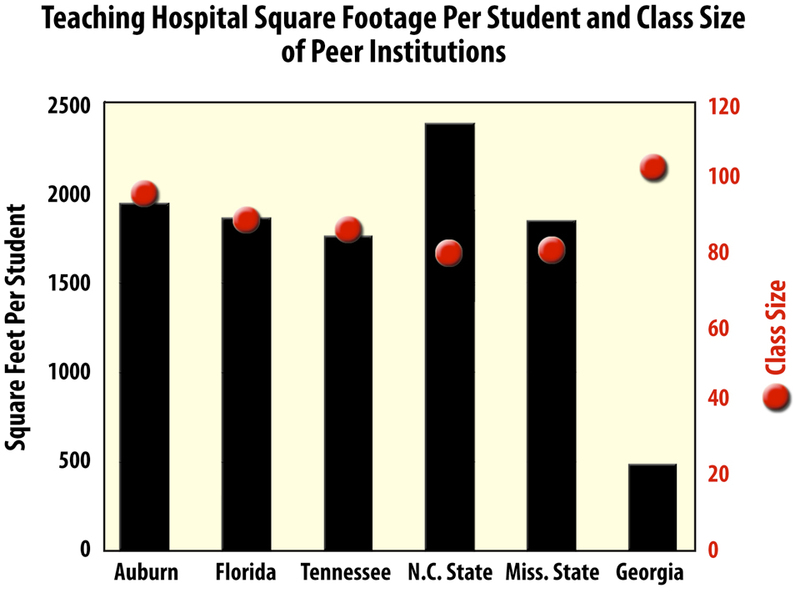 Such is the case for the UGA College of Veterinary Medicine, which literally has doctors working out of converted closets in the outdated 70's facility. Plans have been drawn up for a larger teaching and care hospital complex (below) away from hub of the UGA campus, but so far building funds have not been approved by the state's Governor, though the Board of Regents continues to plead their case. You may have heard the recent story of the police dog, Lakota, who was badly injured in a car crash along with his human partner and wound up at the UGA Veterinary Medical Center for surgery and care. In what the county police PR officials are now calling a "miscommunication," Lakota's surgery bill was left to the officer's family, who wanted to adopt the dog when he was "retired" by the police force immediately after his accident. As a result of coverage by newspapers, television news crews, and even a Lakota Facebook page, the county "reconsidered" the issue and has agreed that the canine's medical bills from injuries sustained while on duty will be covered by the county. Yet the doctors, students, and staff of UGA's Veterinary Medical Center continue to offer exceptional care, as the case of Lakota's multiple surgeries and recovery document. In September the Athens Banner-Herald published a story on the funding plight of the new veterinary teaching hosptial facility vis-a-vis the Regents' request to the Governor. 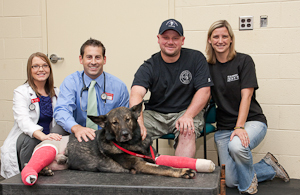 Lakota and his partner's accident was on October 3, 2011, and the coverage has continued, including the reunion of officer and canine, as well as Lakota's return home, and may even continue when he is able to walk again. How can the Governor deny the doctors and students who rehabilitated this local hero? The UGA College of Veterinary Medicine's PR representative told us she didn't know if the Lakota story publicity would help the hospital's capital campaign and emphasized that Lakota's welfare was all they'd really been focusing on these past weeks. Still, a good deed and a good cause may go hand in hand. With state funding and a successful private donation drive, the new facility could break ground early in 2012 and the 500 or so students and veterinarians and their staff could be moving as soon as 2013. Then they'd have another success story to manage. 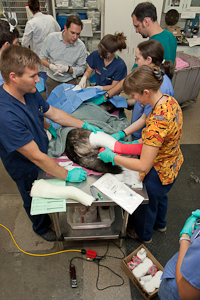 Updates 12/23/2011: Lakota is home and has had all of his casts removed. He's adjusting well to civilian life and just recently became a father to two healthy pups birthed by the family's female shepherd, Mishka (see photo below, courtesy of the K9 Lakota Facebook page). One of the pups will be become Officer Fox's new partner in the next year to year and a half. At UGA, the capital campaign has met over $13M of its $15M goal towards the $80M new facility, which they still wait to have approved by Georgia's Governor in the coming year. Biotechnology Calendar, Inc. is proud to bring together life science researchers and laboratory equipment and supply professionals at the University of Georgia every year at the Athens BioResearch Product Faire, which will be held next on February 15, 2012. For information and a funding report, click the button below.